Cheers to a new Month! This March, St. Thomas University Library is hosting a few great events to celebrate Women’s History Month. Starting on Tuesday, the very first day of March, at 2.p.m., Dr. Xuan Jiang, St. Thomas University Assistant Professor of Teaching English to Speakers of Other Languages, will be discussing her research journey, research agenda, and collaborative writing and publication. “Collaborative Re-writer: A Novice Scholar’s Publication Story” will be held in the Library Atrium at St. Thomas University. Following that event, on Thursday, March 3rd, at 2 p.m. in the Library Atrium, the Library will present “The Story of the Hispanic Woman Grammy Nominee Luisa María Güell.” Music artist Güell will share her personal stories, play a few of her songs, and show portions of a documentary about her life as a Cuban exile. A week from that event, also honoring Women’s History Month, Wednesday, March 9th, from 5:30 p.m. to 7:30 p.m., also in the Library Atrium, there will be a film screening of Pray the Devil Back to Hell, with an introduction by Dr. Judith Bachay, St. Thomas University Professor and Director of Graduate Counseling Programs. A winner of the Best Documentary award at Tribeca Film Festival and Official Section of Sundance Film Festival, the film tells the story of how thousands of Liberian women, both Christian and Muslim, came together to pray for peace and then organized a silent protest in front of the Presidential Palace, pressing for an end to the civil war. Their actions propelled peace talks forward and ultimately brought about an agreement. Light refreshments will be served for all three events. You don’t want to miss out on this series! There’s a seat waiting for you. More details on the Events tab on the Library’s Facebook Page. Can’t wait to see you there! On display at St. Thomas University Library until May 14, 2016, Earth from Space is a poster exhibit that features images and text from the popular Smithsonian Institution exhibition of the same name. Earth from Space was developed by the Center for Earth and Planetary Studies at the National Air and Space Museum and was curated by geographer Andrew Johnston. The poster exhibit is made possible by a partnership between The Smithsonian Institution Traveling Exhibition Service and the U.S. Geological Survey. The 20 posters present large images of the Earth shown from space, color reproductions of images that are captured by satellites that circle the globe recording the conditions and events that occur on the planet’s surface. The rare views of events such as dust storms, forest fires, volcanic eruptions, and Florida’s favorite, hurricanes, are accompanied by text that explains how satellite imagery is gathered and used to explore the Earth. The imagery of the Earth captured in this poster exhibit touches on geography, environmental studies, ecology, oceanography, and meteorology. There are many educational resources and activities available on the “Earth from Space” website, such as lesson plans that will be engaging and helpful in the classroom. The lesson plans range from grades 5 to 12. The Earth Exploration Toolbook contains a chapter called “Annotating Change in Satellite Images” that walks readers through a technique for documenting change detected in before-and-after sets of satellite images. Each lesson plan includes classroom materials tied to National Science Standards. Other related resources include an Earth from Space video produced by NASA and another video of the same title produced by NOVA. Feel free to stop by the Library to view the images of Earth from Space. St. Thomas University Library and the Archbishop John C. Favalora Archive & Museum have joined the Catholic Newspapers Program of the Catholic Research Resources Alliance (CRRA). The CRRA is a nonprofit alliance of institutions collaborating to deliver projects and services in support of its mission—”to provide enduring global access to Catholic research resources in the Americas.” The CRRA initiated the Catholic Newspapers Program in 2011 “to provide access to all extant Catholic newspapers published in North America.” Metadata Librarian Jessica Orozco of St. Thomas University Library and Assistant Archivist Julia Ricks of the Archbishop John C. Favalora Archive & Museum will spearhead the university’s involvement in this program. Initiatives of the Catholic Newspapers Program include creating a comprehensive database of information about North American Catholic newspaper collections on International Coalition on Newspapers (ICON), collaborating with its partners on the digitization of newspapers identified as being a priority, encouraging local newspaper digitization projects, and developing a shared repository for Catholic newspapers. Its latest initiative, Vatican II Years (1958-1972), involves the digitization of nearly 250,000 pages from 11,700 issues of designated Catholic newspapers that chronicled the events surrounding The Second Vatican Council. The CRRA also maintains a list of Catholic Newspapers Online. Catholic newspapers are not well-represented in commercial and public digital databases of historical American newspapers. Yet, they are relevant to an array of issues across disciplines, including topics such as class formation, ethnicity, adaptation to new environments, religious discrimination, charitable work and social justice, school systems, and hospitals. Catholic newspapers in the United States have also played a critical role in communicating with and welcoming new immigrant groups. St. Thomas University Library has digitized all issues of The Voice weekly newspaper of the Archdiocese of Miami and its two-page Spanish-language insert La Voz Catolica. The Voice was published as the official newspaper of the Archdiocese until November 1990, when it merged with the Florida Catholic, which serves the archdioceses of Miami, Orlando, Palm Beach, and Venice, Florida. The Library’s digital collection of The Voice contains the complete run, spanning from March 1959 to October 1990, the final issue of The Voice. The digital collection of La Voz includes issues from 1990 to 2015, with some missing volumes. The Florida Catholic is also archived by the Library, with digital copies available from 2009 to 2012, and 2015, with gaps for the years 2013 and 2014. The Library also holds print copies of these newspapers. The Library and Archbishop John C. Favalora Archive & Museum are also in the process of digitizing photographs from The Voice and La Voz Editorial Photograph Collection and making them accessible on Shared Shelf Commons. To view the photographic collection, on the Browse page of Shared Shelf Commons, scroll down to St. Thomas University: The Voice, and double click the link to view the images. The Library is also currently in the process of building its collection of The Voice newspaper on the Shared Shelf platform, accessible from the St. Thomas University: The Voice Serials Collection link on the Browse page. Double click, and enjoy! 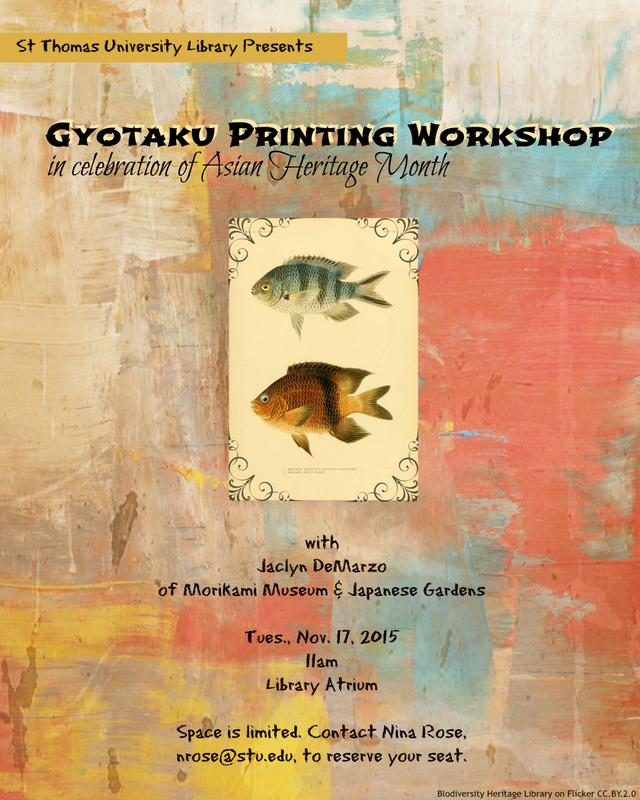 On November 17th at 11am, Jaclyn DeMarzo from the Morikami Museum and Japanese Gardens will be hosting a fish printing workshop in the Library Atrium at St. Thomas University Library. Gyotaku is a Japanese technique of fish printing. During the 1800s, many fishermen in Japan used this method in order to keep track of their records/catches. The fishermen would lay the fish down, cover it in ink and lay a piece of “rice paper” onto the fish. Once the paper is removed, a replica of the fish would appear on the paper. This event is presented by St. Thomas University Library in celebration of Asian Heritage Month. Fall In to Your First Novel this November! 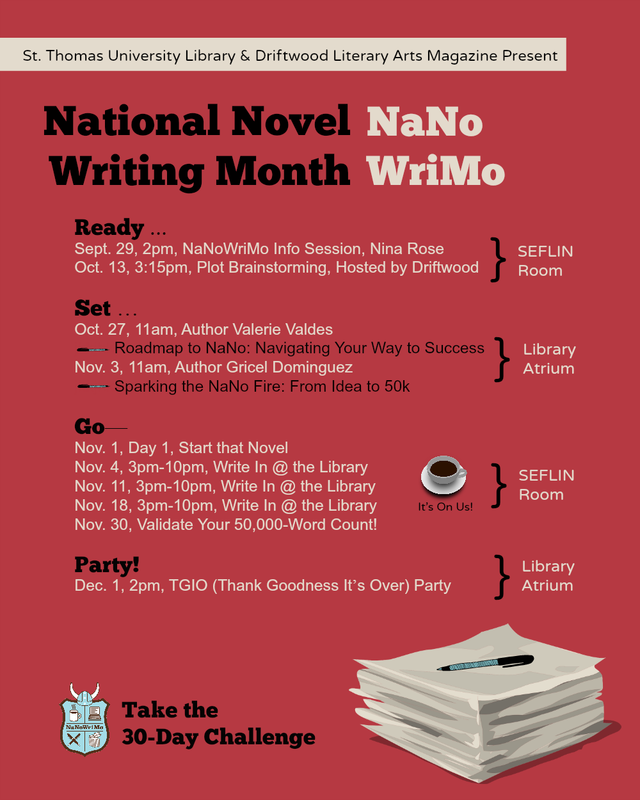 For the first time ever, St. Thomas University Library is playing an active part in National Novel Writing Month (NaNoWriMo, or NaNo for short). To support campus writers and writers in the community, we are joined forces with St. Thomas University’s Driftwood Literary Arts Magazine to host a series of talks and meet-ups for the national marathon-novel-writing event this November. We have several pre-November events planned to get you ready, and then we’ll host Write Ins at the Library, where you can write until the wee hours weekly with others on the same mission. And the coffee’s on us. Then we’ll get together to celebrate your accomplishments in early December at a TGI Over! Party. Write a 50,000-word novel in 30 days. That’s it. But on a national scale in November. That’s 1,670 words (or 5.5 double-spaced pages) per day for 30 days. Why 50,000? Because it’s doable. Here are the basic steps. First, login in at NaNoWriMo. Plan, prewrite, and prepare in October. Or, proceed to next step. Start writing on November 1. Update your word count on the NaNo site as you go. Daily is recommended. 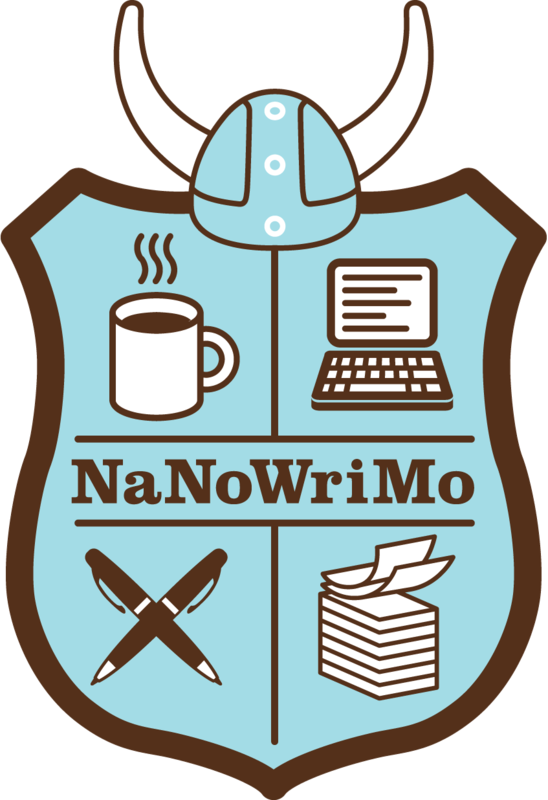 Validate your word count on the NaNo site beginning November 20 but no later than November 30. Once your novel is validated, you’ll be taken to a page with a congratulatory message, a certificate to print out, and social media badges. Now to revise. Participate in the Now What Months, in January and February. #NaNoPrep TweetChat is Sept. 29 at 2pm. If you’ll miss it because you are at our Info Session (see below), just search the hashtag #NaNoPrep to track the conversations. #NaNoCoach TweetChat is planned for Oct. 28 at 12pm. This will be hosted by the published authors who will be your coaches. More details will be available soon. How do you participate in a Tweet chat? Type the hashtag #NaNoPrep into the Twitter search box and interact with people using that hashtag. See this blog post for a description of what Twitter chats are and tools to streamline the experience. These events are posted on the flyer on the Library’s Facebook Page. Like the Facebook event, post your comments or questions, and keep up with comments of other local writers. 14, 7pm, Spreecast, A #NaNoPrep Workshop — Join authors Kami Garcia, Danielle Paige, Jonathan Maberry, and Ellen Hopkins for a preparatory and celebratory webinar. 20, 8pm, Spreecast, Diverse Characters — Discussing how to develop characters and worlds that are unfamiliar to you are authors Dhonielle Clayton, I. W. Gregorio, and Miranda Paul. All you have to do is create a free Spreecast account. Click on the event links above, create an account, and click Remind Me to receive an event reminder. Here is a help guide for participating in a Spreecast. Events for the entire NaNo Miami region are posted here. 11 Ways You Can Start Preparing For National Novel Writing Month Now – Chart your course with these tips from Bustle. How to Prepare for NaNoWriMo: To Outline or Not to Outline – Tips from The Writer’s Digest include identifying the story arc in three acts and creating 30 chapter sketches. Six Questions to Ask Before You Even Write Your First Draft — Also check out the First Draft Checklist, all from the Writer’s Write blog. Top Mistakes Beginning Writers Make, Part I — And other posts on the Writing With Celia blog. A Character Profiler — Character-building strategies, tips, and tools from NaNo Blog. A What-if Builder — Make a list of What-Ifs to help you get unstuck in November. Plot Doctoring: How to Make Plotting Simple — Tips on constructing a textable plot summary. NaNo Prep Resources – An extensive list of resources to help you prepare for November. We have a display of fiction-writing books in the Library Atrium. Titles are listed here, and they include a few novels written during NaNoWriMo that went on to get published. Here is a complete list of published NaNos. Novel Writing Workbook – Prepared for high school students in the Young Writer’s Program, this workbook may be just the thing first-time-NaNo college students need to jump start the process. Save it as a PDF and voila, you have a personal workbook with fields you can type right into as you work you through your first novel. Past NaNo PepTalks — Letters by well-known writers to inspire Wrimos (that’s you). NaNo page with tool discounts, freebees, and other offers. Have some other great resources to add to the mix? Post them in the Comments section. The Library has curated three photographic exhibits from The Voice/La Voz Editorial Photographic Collection of the Archdiocese of Miami, which is housed at the Archbishop John C. Favalora Archive & Museum at the Library. The exhibits are Latino Americans: Cuban Experiences in Miami, Miami: A Multicultural Hispanic Community, and La Virgen de la Caridad: Images from the Diaspora. The exhibit opens today, September 8, 2015, the feast day of Our Lady of Charity (La Virgen de la Caridad), patroness of Cuba. To celebrate this occasion, there will be a 12:15 pm mass on September 8, celebrated by Archbishop Thomas Wenski. The mass will be followed by a procession to the Archbishop John C. Favalora Archive & Museum at the Library, a reception, and tours of the exhibits, from 1:15 pm to 6:00 pm. Exhibition details are available on the Library website. Library staff have created pathfinders and lesson plans, which are linked to from the Library’s Exhibits page. 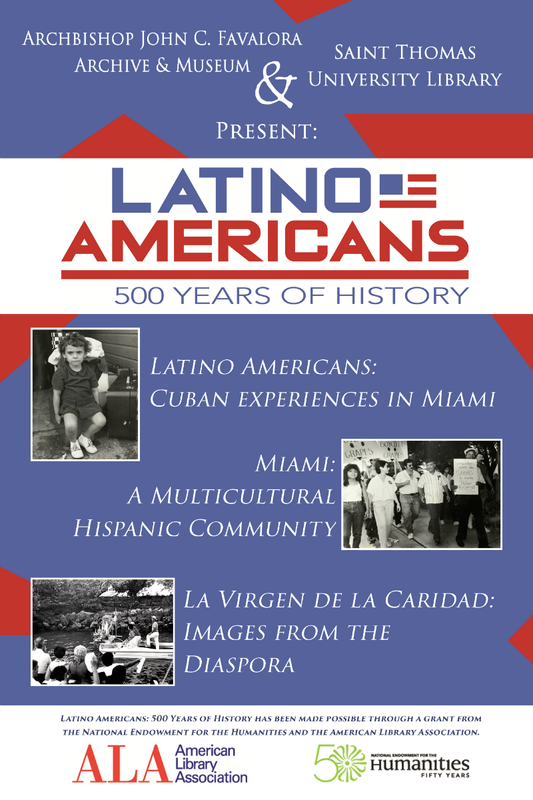 This exhibition is one among many other events that the Library will host on “Latino Americans: 500 Years of History,” made possible by a grant from the National Endowment for the Humanities and the American Library Association. St. Thomas University Library has been selected to receive a competitive Latino Americans: 500 Years of History grant from the National Endowment for the Humanities (NEH) and the American Library Association (ALA). As one of 203 grant recipients selected from across the country, St. Thomas University Library will receive a cash grant of $3,000 to hold public programming — such as public film screenings, discussion groups, oral history initiatives, local history exhibitions, multi-media projects or performances — about Latino history and culture. The film series will be combined with programs involving esteemed St. Thomas University faculty. Dr. Jose Rocha, a faculty member for the St. Thomas University School of Business, will highlight the unique aspects of Miami Hispanic/Latino Businesses and explore what the South Florida Business community has done to attract and develop our current Hispanic/Latino business leaders, and what more it can do to build the next generation of great Hispanic/Latino business leaders. Dr. Ondina Cortes, a faculty member in the St. Thomas University School of Theology and Ministry, will examine the experience of Cubans within the wider lens of Hispanic/Latino Americans, comparing the dreams and disappointments of Latino immigrants over time, offering solutions for Latino’s love-hate relationship with the United States, and highlighting what Latinos have contributed in the forging of this nation and what they have gained and lost in in the process. To build on the St. Thomas University motto, “Developing Leaders for Life,” programming will also examine the current generation of Hispanic/Latino leadership in Miami-Dade and how to develop the next generation of great Hispanic/Latino leaders of our nation. Visit St. Thomas University Library’s Facebook Page in Fall 2015 for a schedule of events or contact Dean of the Library Dr. Jonathan Roach at jroach@stu.edu. St. Thomas University Library is located at 16401 NW 37th Ave., Miami Gardens, FL, 33054. The Latino Americans: 500 Years of History grantees represent 42 states and the District of Columbia, and include 78 public libraries, 68 college/university libraries and organizations, 19 community college libraries, 10 state humanities councils, 12 museums and a range of other nonprofit organizations. View a full list of the recipients. Latino Americans: 500 Years of History is part of an NEH initiative, The Common Good: The Humanities in the Public Square. Created in 1965 as an independent federal agency, the National Endowment for the Humanities supports research and learning in history, literature, philosophy and other areas of the humanities by funding selected, peer-reviewed proposals from around the nation. Additional information about the National Endowment for the Humanities and its grant programs is available at www.neh.gov.